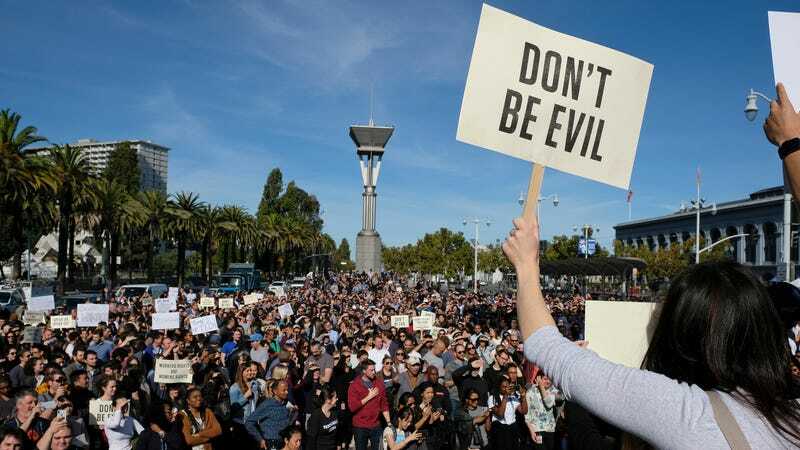 Google employees protesting the company’s handling of sexual misconduct allegations in a walkout on Nov. 1, 2018, in San Francisco. After a year of protests by its own staff against its work with the military, alleged plans to build a censored Chinese search engine, and handling of sexual harassment allegations against executives, Google is doing some soul-searching and self-reflection over the true meaning of “Don’t be evil.” Just kidding! According to the Times of London, they’re doubling down on finding and firing leakers. Tensions between employees over leaks to the press have also resulted in foul-mouthed arguments, Mr Poulson revealed. During a question and answer session at a company-wide meeting, a senior engineer took the microphone to shout “F*** you leakers” at his fellow colleagues.... [Poulson] said employees’ concerns about Dragonfly have largely been ignored by management, who are focused on preventing leaks. “The narrative is that leaking is bad and that the number one priority is to prevent any leaks,” said Mr Poulson, who worked for Google for two- and-a-half years, both at the company’s headquarters and its office in Toronto. Notably, Poulson wrote in a letter to members of the Senate Committee on Commerce, Science, and Transportation that he had only learned of Dragonfly from public media reports originating in the Intercept, despite efforts from employees to get senior management to disclose more information about what they were working on. Similarly, Google’s work with the Pentagon to build AI tools for analyzing drone footage became public knowledge via anonymous employees who spoke with Gizmodo. Its handling of at least three cases of senior managers accused of sexual misconduct, which included non-obligatory cash payments to two departing executives and the third remaining “in a highly compensated post at the company,” became known in part because of current and former staffers who spoke with the New York Times, many anonymously. Battles over Google’s alleged culture of secrecy are not new. In 2016, court documents from a lawsuit by a Google engineer who said he was falsely accused of leaking to the media alleged that employee confidentiality agreements restricted staff from making public “without limitation, any information in any form that relates to Google or Google’s business that is not generally known.” News of an internal “spying program” (Stopleaks) also emerged that year. But with three of the tech giant’s biggest PR headaches this year being at least partially the result of whistleblowers who spoke up, management seems to be tackling the problem more belligerently. Gizmodo has reached out to Google for comment, and we’ll update this post if we hear back. Unrelatedly, anyone reading this with information on the goings-on at any major tech company can tip Gizmodo using our anonymous SecureDrop system, by sending an email to tipbox@gizmodo.com, or contacting any of our writers directly.